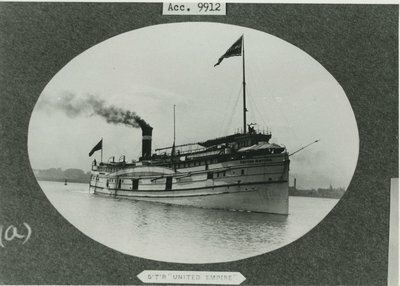 1882, Nov 1 Launched with difficulty; pulled off by steamer OMAR D. CONGER and tugs FRANK MOFFATT and KITTIE HAIGHT; cost $125,000; illistraded on 1902 Canadian $4 bill. 1883, Mar 2 Registered Sarnia, ONT; ran with MANITOBA, QUEBEC and ONTARIO, Sarnia, ONT-Duluth, MN. 1883 Brought large numbers of immigrants to Duluth and Prince Arthur Landing. 1883, May Two steel arches from England installed. 1888, Jul Lost rudder and shoe, Bear Lake. 1890, Jun Collision with schooner KINGFISHER. 1890, Oct Electric lights installed. 1893, Jul 14 Hard aground opposite Point Edward, ONT; laden with flour and grain; bound Duluth-Point Edward. 1895, May Grounded, dense fog near Duluth; released. 1904, 1905 winter Rebuilt Collingwood, ONT; renamed SARONIC; owned Northern Navigation Co., Sarnia, ONT. 1913 Owned Canada Steamship Lines; ran Montreal-Lakehead with package freight. 1914 Ran Quebec-North Shore Gulf of St. Lawrence routes. 1916 Rebuilt as steambarge, Sarnia; measurements unknown. 1916, Aug 20 Stranded, burned Cockburn Island, North Channel, Lake Huron; total loss. 1918 Owned James R. Andrews Transportation Co., Escanaba, MI; hauled pulp for Detroit Sulphite Co.
1921, May 19 Caught fire, St. Clair River, extinguished with minimal damage.